Before we start with the ReportViewer, please refer this page page for general information regarding integrating Syncfusion widgets. For quick start, we already configured a template project in GitHub repository syncfusion-template-repository. Run the below set of commands to clone the repository and install the required packages for Syncfusion Aurelia application. This section explains briefly about how to create a ReportViewer in your web application with Aurelia. The below steps describes to create Syncfusion Aurelia ReportViewer component. Create `reportviewer` folder inside `src/samples/` location. 1.Create reportviewer.html file inside src/samples/reportviewer folder and use the below code example to render the ReportViewer component. Default RDL Report will be rendered, which is used in the online service.You can obtain sample rdl/rdlc files from Syncfusion installed location (%userprofile%\AppData\Local\Syncfusion\EssentialStudio\17.1.0.38\Common\Data\ejReportTemplate). 2.Create reportviewer.js file inside src/samples/reportviewer folder with below code snippet. 3.Create reportviewer.css file inside src/samples/reportviewer folder with below code snippet. 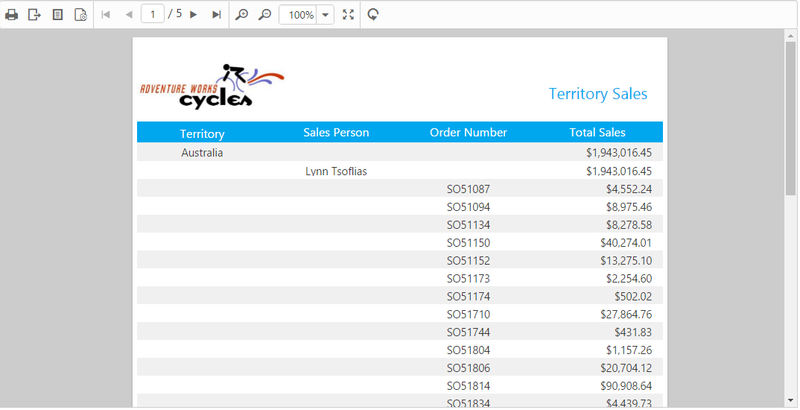 1.Create reportviewer.html file inside src/samples/reportviewer folder and Set the reportPath from SSRS and SSRS reportServerUrl in the ReportViewer properties. 4.Run the application and you can see the ReportViewer on the page as displayed in the following screenshot. 1.Create reportviewer.html file inside src/samples/reportviewer folder and assign the RDLC report path to ReportViewer’s reportPath property and specify the processingMode as local in the ReportViewer properties. Default RDLC Report will be rendered, which is used in the online service. You can obtain sample rdl/rdlc files from Syncfusion installed location (%userprofile%\AppData\Local\Syncfusion\EssentialStudio\17.1.0.38\Common\Data\ejReportTemplate).